Representatives of the national Gray Panthers went to Capitol Hill in November to present their position regarding Social Security. They spoke with members of the Deficit Commission and presented their counter proposals against anticipated recommendations by the Commission to cut Social Security benefits. For 75 years, Social Security has remained a promise of economic protection and stability for the Americans who have paid into this program. As we now celebrate three-quarters of a century of accomplishments for this program, we must also do our part to ensure that Social Security is not weakened by those who wish to balance bailouts on the backs of Americans. Social Security is America's most successful anti-poverty program and remains the most fiscally responsible part of our federal budget. In fact, recent polls from the National Committee to Preserve Social Security and Medicare indicate that 85% of adult Americans are opposed to cuts to Social Security to decrease the deficit. 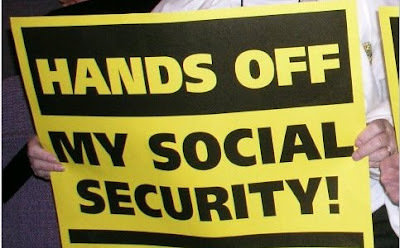 However, while many Americans remain united on this issue, Social Security continues to face threats from increased polarization in Congress and those with anti-entitlement agendas. The 2010 Social Security Trustees report shows that Social Security is not facing an immediate threat. The surplus within the Social Security trust fund is estimated to grow to $4.3 trillion by 2023 and remain able to pay benefits in full through 2037, and 76% of benefits thereafter. Yet, the opposition continues to project "doomsday" crisis reports and myths to the American public in their efforts to garner support for cuts to the Social Security program. Proponents of these cuts, such as House Republican Leader John Boehner, would rather cut Social Security in order to pay for the war in Afghanistan. Outrageously, Boehner stated that, "Ensuring there's enough money to pay for the war will require reforming the country's entitlement system." Boehner also calls for increasing the Social Security eligibility age. However, a raise in the Social Security eligibility age would result in about a 20% benefit cut for recipients, hurting lower income beneficiaries working in manual labor and those with shorter life expectancy the most. While it is evident that our government must make tough decisions to revive our down-turned economy, it is important to remember that cuts to Social Security would not only hurt seniors, but will also detrimentally affect people with disabilities, people who are unemployed, and women and children of deceased spouses/parents. Cuts to this program stand to unfairly burden the most vulnerable populations of Americans. While Former Senator Alan Simpson, the Co-chair of the National Commission on Fiscal Responsibility and Reform, declares that the “Gray Panthers... don’t care a whit about their grandchildren," we adamantly refute his comment and we vow to continue working to ensure that Social Security remains there for them in their future. Eliminate the annual cap on taxable income and raise that cap so that wealthier people are paying more to Social Security. Under current law, wages over a certain yearly total ($106,800 in 2010) are exempted from Social Security payroll taxes. This means that a worker earning $106,800 a year pays the same amount of FICA taxes as a CEO who makes millions of dollars a year. Let the Bush tax cuts for the wealthy expire. The revenues gained from these expirations are far more than enough to fill current state budget deficits for the next 10 years while still leaving an additional $2.76 trillion dollars left over to promote further economic recovery. There is no place for tax cuts in a deficit reduction proposal as was suggested by the Chairmen of the Deficit committee last week! End the wars. Funds saved from Social Security should not be used to pay for wars; rather, we should cut funds for wars to finance Social Security. The Gray Panthers support the Chairmen’s proposed cuts to Defense spending, but more cuts can and should be made! Extend outreach and enrollment. Gray Panthers believes that not only should Social Security be kept intact, but that outreach should be increased and enrollment expanded to get a greater number of older adults in poverty into the program. The retirement age increase proposed by the Commission is just a particularly cruel way of cutting benefits. The age at which the elderly can retire on full Social Security benefits is already increasing to 67 by 2027. The Chairmen’s plan would “index” the retirement age to increase in longevity, meaning it would hit 68 in about 2050 and 69 in about 2075. New York Times opinion columnist Paul Krugman has pointed out, that “the people who really depend on Social Security, those in the bottom half of the distribution, aren’t living much longer. So you’re going to tell janitors to work until they’re 70 because lawyers are living longer than ever." Is this how a humane society proposes to care for its less fortunate? Not if the Gray Panthers have anything to say about it! Harry Targ : What Happens Wednesday?